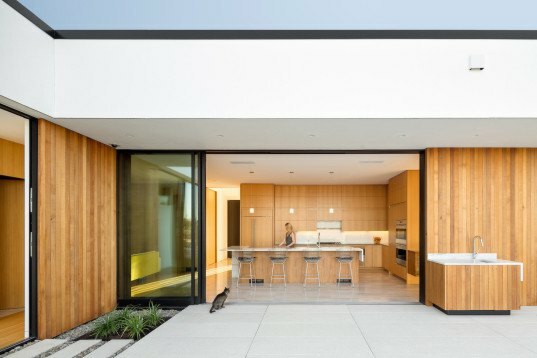 Outside, the LEED-certified home features a storm water management system which allows water to irrigate the landscape onsite, rather than draining away into the city’s sewers. A separate rainwater recovery system provides potable water for the house. A geo-exchange heat pump produces heat from groundwater and solar arrays are used to power the house and heat the pool as well. Exterior blinds and deep cedar overhangs shade the extensive windows and LED light fixtures with auto-dimming minimize the use of electricity for lighting. The exterior walls were created using white stucco planes with large panels of inset glass and cedar. The structure sits on a base of dark grey ironspot brick and exposed raw steel panels. The exterior cedar overhangs extend inside the house, forming the varied-height ceilings. White marble inside echoes the white stucco outside, adding to the seamless flow between the exterior and interior of the house. The LEED-certified home features a wide array of eco-friendly additions, making the home largely independent of the city's water and electrical systems. 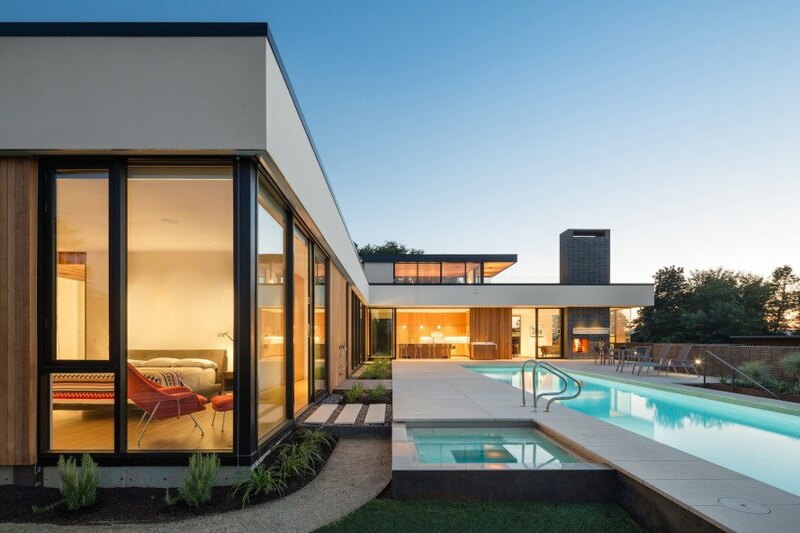 The exterior walls were created using white stucco planes with large panels of inset glass and cedar.